At Heritage, we believe that funeral prices should be at a level that is affordable to all families. Heritage Funeral Home has recently price shopped the competitors and estimates that by using our firm, families save on average $2000 on our services alone. Families usually save hundreds on our merchandise as well. These savings are in addition to Heritage providing our impeccable service in our clean, comfortable, and spacious facilities. If you happen to find a lower price prior to the service, Heritage will match it and give you 10% of the difference for identical services or merchandise on a current published General Price List by any local funeral home in Madison county. The same selected services and merchandise must be listed on our General Price List. Heritage Funeral Home guarantees that if you are not 100% satisfied with any aspect of our service, we will make every effort to correct the situation. If we cannot correct it to your satisfaction, you will not be charged for that particular service item. We will guide your family in creating a meaningful ceremony to honor the life and memory of a loved one. A ceremony can be anything you wish it to be: simple or elaborate, traditional or unique. Our promise is to provide this to you at a most reasonable price." 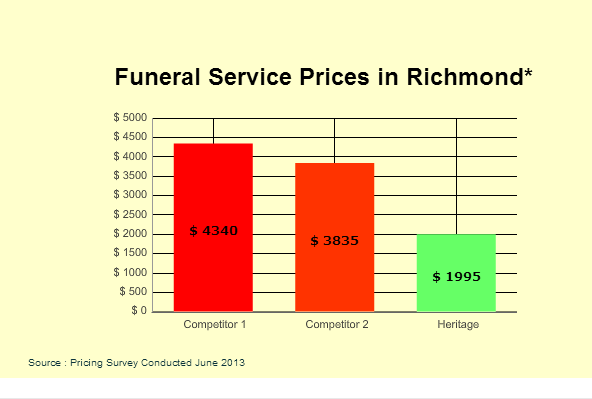 *In June 2013, pricing surveys were conducted in the Richmond area funeral homes. Pricing data was taken from general price lists obtained from the funeral homes. The prices are accurate based upon information obtained during the survey. The figures are based upon the following services; transfer of remains to funeral home; embalming; dressing; cosmetizing; basic services and overhead of funeral director and staff; use of facilities for viewing and funeral ceremony, or supervision of viewing and ceremony at other facility; hearse to local cemetery. It does not include limousine(s), casket, outer burial container, memorial package, or cash advance items. Prices subject to change without notice.